Pony’s design for the previous season was kept for the second year of their second contract with United, but this time there was one small difference. After their one year deal came to a close, Telewest renewed their contract with the Club, and a larger logo was worn on the front of the shirt, this time with the black text and green sphere now printed directly onto the shirt instead of the white background patch. This stood out much better than on the previous white Away kit. Other than that, the strip was the same, with the diagonal tiger stripe effect though-out, with black panels down the sides as well as down the sides of the sleeves, and the black polo style collar. A stand out match for this kit was the League Cup Semi Final against Aberdeen at Tynecastle in October 1997, a fantastic performance that saw United win 3-1 to reach the Final. 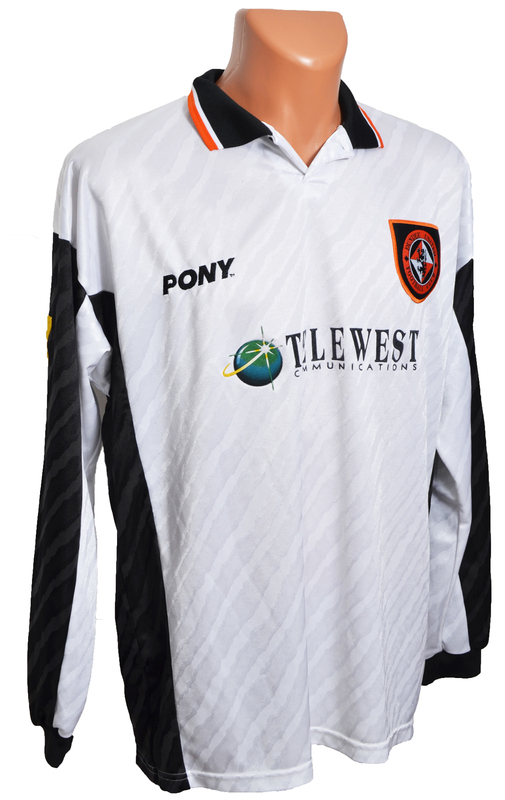 The Pony Away kit’s final match was a 0-1 defeat to Motherwell at Fir Park in March 1998.